In order to represent physical quantities such as position and momentum in more than one dimension, we must introduce new mathematical objects called vectors. Technically speaking, a vector is defined as an element of a vector space, but since we will only be dealing with very special types of vector spaces (namely, two- and three-dimensional Euclidean space) we can be more specific. For our purposes, a vector is either an ordered pair or triplet of numbers. 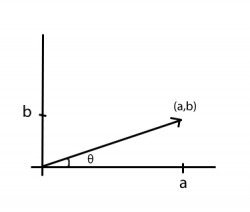 On a two-dimensional plane, for instance, any point (a, b) is a vector. Graphically, we often represent such a vector by drawing an arrow from the origin to the point, with the tip of the arrow resting at the point. The situation for three-dimensional vectors is very much the same, with an ordered triplet (a, b, c) being represented by an arrow from the origin to the corresponding point in three-dimensional space. Unlike scalars, which have only a value for magnitude, vectors are often described as objects that have both magnitude and direction. This can be seen intuitively from the arrow-like representation of a vector in the plane. The magnitude of the vector is simply the length of the arrow (i.e. the distance from the point to the origin), and can be easily computed using the Pythagorean Theorem. The direction of a vector in two dimensions can be characterized by a single angle θ (see ); the direction of a vector in three dimensions can be specified using two angles (usually denoted θ and μ ). While these ideas are perfectly valid in our case (since we're dealing with vectors in finite-dimensional Euclidean space) it is not a good idea to become too attached to the notions of "direction" and "magnitude" for vectors. For instance, in quantum mechanics vectors often come in the form of functions (for instance, a particle wave function), and in such a case it doesn't make sense to talk about the "direction" of the vector. We don't have to worry about these complications for now, though, and in the following SparkNote we will rely heavily on basic geometric notions when we discuss vector addition and multiplication.